A squirrel went on a violent spree in a German town. He attacked and injured three people before a 72-year-old man stopped and killed the aggressive squirrel with his crutch. The squirrel first ran into a house and jumped on a 70-year-old woman and sank its teeth into her hand. The panicked woman ran out into the street with the squirrel still holding onto her hand, and she finally was able to shake the animal off. Then the squirrel entered a construction site and jumped on a worker, biting him on the hand and arm. The worker was able to shake the rodent off. 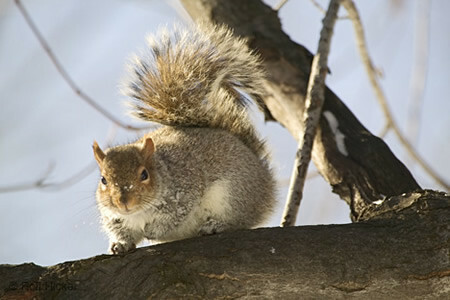 After that attack, the squirrel ran into a 72-year-old man’s garden and attacked the man on the arms, hand, and thighs. The man was able to kill the squirrel with his crutch. Experts think that the attack occurred because the squirrel was ill or because it is mating season. That is definitely not the way to attract the female squirrels. This entry was posted on Friday, June 15th, 2007 at 9:00 am	and is filed under Other Pets, National Dog, Cat & Pet Info, News for Cats, Dogs & Owners. You can follow any responses to this entry through the RSS 2.0 feed. Both comments and pings are currently closed. Maybe the squirrel got into some bad pet food. There is plenty around. Can’t count out the squirrel was tired of seeing it’s friends get run over by cars, harassed by humans, getting run out of it’s home, etc. hopefully they tested the animal for R-A-B-I-E-S????? DUUUUHHH??? if I were those people & they hadn’t tested it, I would definitely get my rabies shots! hum…All the people it bit were old. Maybe it is some sort of secret plot to get rid of the old folks. HA!–a trained attack squirrel! that reminds me of the government scheme to insert eavesdropping devices into metamorphosing moths so they would be incorporated into their bodies. they would then be able to control the moth’s behavior with the device, steer it to the correct target, then listen in on conversations. i know how he feels. however next time can the squirrel terrorists direct their rage at a more appropriate target like, oh, the fda and certain uppity pet food concerns…. tree rats. my 2 cockatiels sit in the window and SCREAM at the squirrels. there’s all sorts of wildlife back there including humans of questionable intentions but it’s only the squirrels that set the birds off. that’s interesting–I have a now-extremely fat squirrel coming to my bird feeder every day & emptying it (I need to move it onto a wire like the other feeders). When I go out to refill, he/she comes down the tree really close & guards the feeder, kind of freaks me out. It came down the tree by the deck the other day 2 feet from 4 cats & 3 dogs & me & screamed at all of us violently. I finally shooed it away with a broom because it was getting a little scary so close to the pets. It went onto a sapling & started stripping bark with it’s teeth like it was really po’d at us all. Maybe it’s the climate change–the world will soon be full angry squirrels. Itchmo, your play-by-play was a hoot!